As you set out on a magical journey that bridges worlds both within and without, you are invited to contemplate the nourishing wisdom embodied in these images. The profound beauty of the natural world and all that it represents—the cycles of life, rebirth and renewal, the mystical power of plants and animals. This is the first in a series of coloring books celebrating nature and it's mysteries. Gold Medal - Living Now Book award recipient. Available through my on-line shop or many other outlets. 80 pages, 8 1/2"x11". I am so honored to receive a Gold medal for Sacred Nature coloring book. Details of the 18ft long Mural I created for the Oregon Country Fair Music and Art festival. Very fun project - loved working this large. Thought it would be fun to create details of the full image for framing — available in my shop. This 18ft long Mural was created for the Oregon Country Fair Music and Art festival. Very fun project - loved working this large. That’s me there with a very happy “I’m finished” grin on my face. Part of the "Coloring Books for the Soul" series, a majestic adult coloring book packed with original art and evocative wisdom words, featuring imagery that celebrates the animals, both real and imagined, that we revere across cultures—a creative and inspiring invitation to nourish our souls and reconnect with our spirit. Loved working on this series of Sacred Notebooks. Each one has a nature theme. Crows, winged icons dotted throughout the book. Octopus has sea life teaming through the pages. And the Sacred Bee - all things that focus on pollinators. These are available in my shop or on Amazon here. My offering to the resistance. 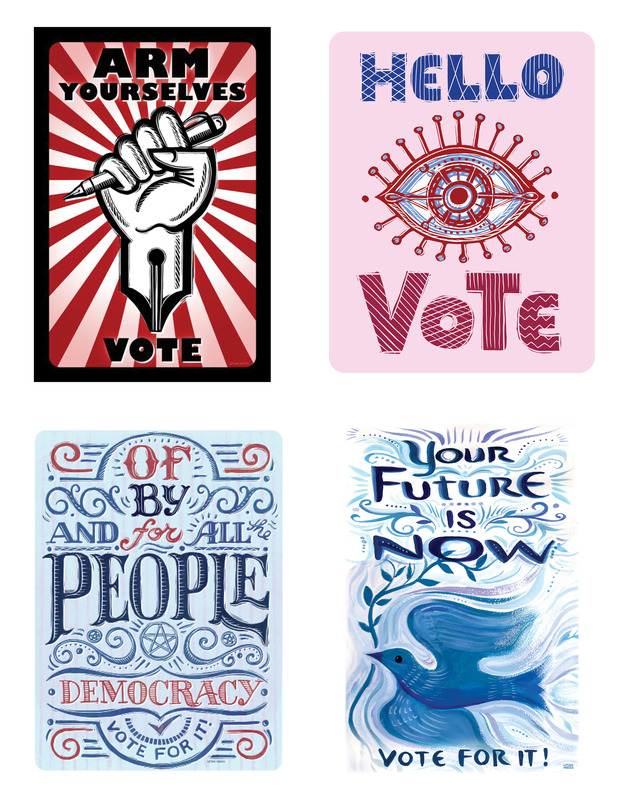 These posters are available as a FREE downloads for those interested in carrying them in a march or sharing it on a social media platform. Please help spread the word - Midterm elections are critical to help forge the direction of a Free and Just society - it's your America. They are here for your personal use. © Lydia Hess - All rights reserved. DOWNLOAD HERE – I am offering these images as a page of postcards for downloading and printing on cardstock. Send 'em to friends, or mail some to your representatives. Spread the message that we are not going to sit this one out. Personal use only please. DOWNLOAD HERE – This poster is available as a FREE download for those interested in carrying it in a march or sharing it on a social media platform. Please help spread the word - Midterm elections are critical to help change the direction of safety in our society - its time to take up Arms. DOWNLOAD HERE – This poster is available as a FREE download for those interested in carrying it in a march or sharing it on a social media platform. Please help spread the word - Midterm elections are critical to our freedoms as Americans. DOWNLOAD HERE – This poster is available as a FREE download for those interested in carrying it in a march or sharing it on a social media platform. Please help spread the word - Midterm elections are critical to help steer our elected officials to better serve all of America. DOWNLOAD HERE – This poster is available as a FREE download for those interested in carrying it in a march or sharing it on a social media platform. Please help spread the word - Midterm elections are critical to make our voices and votes known! DOWNLOAD HERE – This poster is available as a FREE download for those interested in carrying it in a march or sharing it on a social media platform. Please help spread the word - Midterm elections are critical to secure Every Woman's Right to CHOOSE. These are a series of the various female figures I have had the privilege of illustrating. Some relate to women's health and others are purely enjoying life to it's fullest. My tribute to the formidable Frida Kahlo. This image was created with my traditional scratchboard technique collaged with monoprint art. Originally published in my Sacred Angels, Coloring Books for the Soul by HarperElixir. Available as Totes and Framed Prints and other fun products on Society6. This Venus inspired earth angel image was created with my traditional scratchboard technique. Published in my Sacred Angels, Coloring Books for the Soul by HarperElixir. Great wine buys of the season. American Lawyer Magazine. University of Washington Alumni Magazine. Featured in the Sacred Nature coloring book. Also published in Animal Spirit, published by Duncan Baird Publishers. I have been designing and producing wall calendars, monthly planners, writing journals and greeting cards for Amber Lotus Publishing for the last 9 years. These are a few samples of those projects. These ageless icons and emblems of spiritual experience embody our innermost longings, our dreams and visions, and our connection to that which is greater than ourselves. This is the second book in the Coloring books for the Soul series, published by HarperElixir. Designing covers for Journals and engagement calendars has been a wonderful challenge. I concept the design, work with illustrators and photography to create these products for Amber Lotus Publishing. I was challenged with the concept of creating some Day of the Dead inspired art for one of Amber Lotus' calendars. These illustrations evolved out of the love of the traditional Dia di los Muertos imagery. Inspired by my Sacred Nature coloring book, I thought it would be fun to created a skull from organic floral motifs. Combining the carved scrapper board with monotype brayer prints, I love the textured, layered feel. Published in the Day of the Dead wall calendar for Amber Lotus Publishing. This smiling skull image was created with my traditional scratchboard technique combined with monotype printmaking techniques. Published in my 2017 Magical Garden Coloring calendar in Black and White, and on the cover of the 2018 Day of the Dead wall calendar, both published by Amber Lotus Publishing. This happy go-lucky skull image was created with my traditional scratchboard technique combined with monotype printmaking techniques. Available as an archival print in my shop. A variation on the theme for Day of the Dead, sugar skull art. This piece was created with traditional watercolor on paper. Published in the 2016 Day of the Dead wall calendar for Amber Lotus Publishing. Coconut Bliss - non-dairy treat. Oh so yummy. What a 'treat' to work on the packaging for this organic product. They were making a step into larger distribution for their ice cream alternative and came to me for the graphic imagery. Look for it in your Natural Grocers food stores. Each colorful painting is collaged with monotype imagery created through traditional print making techniques. I have chosen these inspirational quotes as pairings to these light and uplifting images. I hope they brighten your day. They are available as framable archival prints from my shop. Kona Brewing has been so much fun to work with over the years. These are a series of images used on branding and special event posters. Branding for commemorative anniversary beer for Kona Brewing. This archetypal symbol is an expression of love in all its radiant forms. Elegant yet simple, the image of the heart has universal meaning. Featured in the 2018 Art of the Heart wall calendar by Amber Lotus Publishing. Featured in the 2016 Art of the Heart wall calendar by Amber Lotus Publishing. Featured in the Sacred Angels coloring book as a black and white image. One of the colorable hearts in Sacred Nature the first in the Sacred Coloring Books for the Soul series - HarperCollins Publishers. This selection of animal focused images includes editorial magazines, books and story telling as well as posters and branding. Created with my traditional scratchboard technique. Published in my Sacred Animals, Coloring Books for the Soul by HarperElixir. For the love of Trees. One of my very favorite subjects to work with. This is a sampling of images for editorial, wedding invites, books, and commercial branding. Originally concepted and illustrated for a wedding invitation for Todd and Megan Blossom. Created for Sacred Nature - Coloring books for the Soul - Harper Collins Publishing. Theatre Performances and Theatre Classes for Children in Portland, Oregon. Originally published in The Witches Companion - Lewellyn Publishing. Originally created for Harper One publishing to accompany the Earth Path Book, by Star Hawk. This series has grown and morphed into several variations. I used the last 4 variations in the Sacred Nature coloring book. Oregon Country Fair is held every summer for 3 days in a magical wooded forest. These are a few of the projects I worked on for that organization. Very fun, always magical. I have a limited number of signed collector's editions available for sale in my shop. A commemorative poster celebrating this fabulous, magical event. Signed screen prints are available in my shop. After 20 years of Fair Family News they came to me for a refreshed look. This is the current masthead on their e-news letter. I also provided a black and white version for the snail-mail paper version. In addition to designing 5 of my own coloring book covers for HarperCollins publishing. I have also designed several covers for Amber Lotus publishing featuring other artists work. What a joy to work with Geninne Zlatkis on the cover & interior design of her coloring book. This was published by Amber Lotus Publishing. Working with Katie Daisy on a series of products has been a joy. We collaborated to create the cover & design of her coloring book published by Amber Lotus Publishing. Jen Delyth is an accomplished Welsh artist. I designed the cover of her coloring book for Amber Lotus Publishing. Cori Dantini has a wonderful whimsical personal style - I loved working with her and her beautiful artwork to create this coloring book. Published by Amber Lotus Publishing. In addition to authoring & illustrating this coloring book, HarperElixir (An imprint of HarperCollins Publishing) contracted me as a designer to create the covers of each of my five books in the Coloring Books for the Soul series. Coloring Books for the Soul published by Harper Elixir.